It’s hard to photograph egg casseroles. Every time I’ve tried, it just doesn’t look as good as it tastes. I suppose it’s the bland colors. 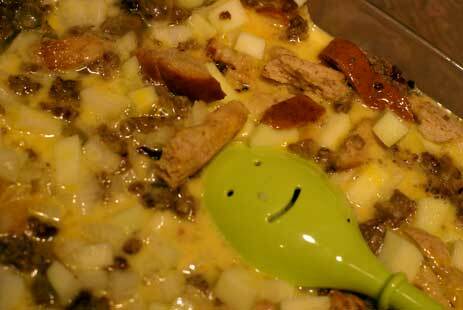 Anyways…L-O-V-E-D the sausage and apple flavors in this casserole! Spray 9×13 baking dish with non-stick cooking spray. 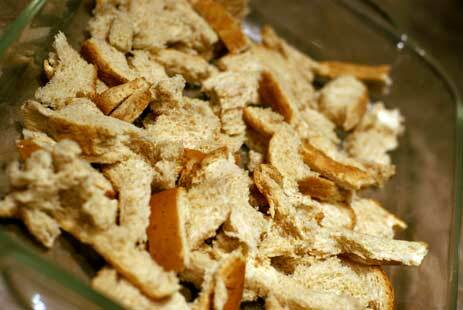 Tear 6 slices of bread and place into the baking dish. Add 1 lb. of cooked sausage. 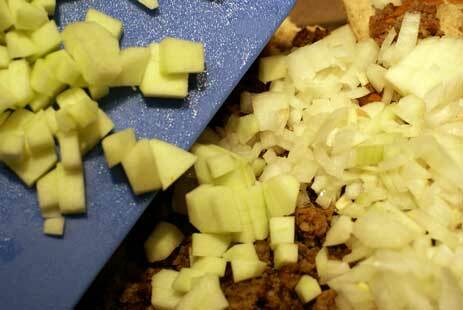 Add 1 chopped onion and 1 chopped granny smith apple. Toss together in the baking dish. In a bowl, whisk together eggs, milk and salt and pepper. 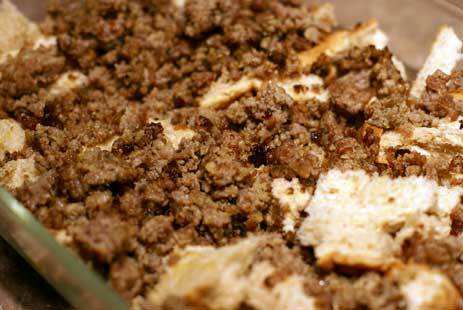 Pour over the bread, sausage and apple mixture in the baking dish. (For best results, refrigerate overnight.) Bake at 350 for 45-55 minutes. 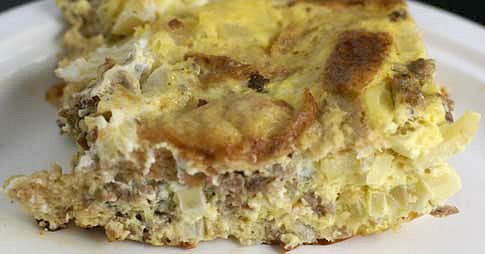 Serve Sausage Apple Egg Casserole with fresh fruit. This looks tasty. At first I didn’t think so, but the pictures reminded me of my Thanksgiving stuffing that has sausage and apples in it. I love the overnight thing. It makes mornings so much easier. I’ll have to try it soon! 2nded!!! where did you get it? We love that you are such willing guinea pigs!!! Mmmmm some of my most favorite things combined- can’t go wrong. P.S. Cute spoon!!! At first, I wondered about the meat/fruit combination, but quite frankly, the spoon sold me! 🙂 I LOVE that spoon! I think that I will try this out next week for my biweekly mom’s brunch. I’m a *very* broke college student, I just made it for my roommates & they loved it!! Totally a great idea. You’re page has saved my pocket! Going to have to try this with for my hungry group of teenage boys. I too love the smiley face spoon. Going to have to find me some of those spoons. Looks great! I don’t know how to print just the recipe and not the pictures and other stuff. Please let me know. Thanks.! Click where it says “print this page” and it will pull up a “green” printable without all the photos. You’ve got this filed under dairy/casein free but it has milk. I was wondering what you use as a milk substitute? I have my own (soy milk & Coffee Rich are my primary subs), but I’m curious as to what you would recommend. I use rice milk for just about everything! And used it in this recipe. I made this as part of the OAMM September Menu and my son saw the label in the freezer and is so excited! Apparently, someone made this for a breakfast at school last year or something similar! 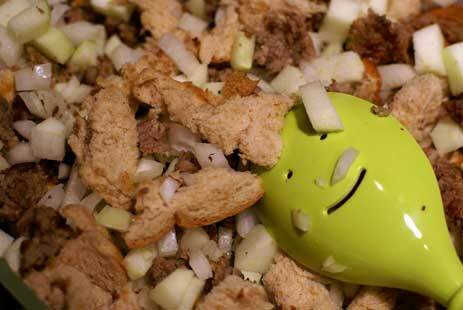 I left out the onions, though…my family is totally adverse to onions! Okay, so I’ve tried this recipe. However, I changed it up a bit and it was very tasty. I tossed the bread with melted butter, and I sauteed the sausage and apple before mixing together with other ingredients. It was very good that way. I also left out the onions so we could get the full flavor of the sausage and apple. And as for the picture, you could cut a nice neat wedge instead of scooping it out and set it nicely on a lace doiley lined pretty plate with fresh strawberries & raspberries. Good luck next time around. Just tried this recipe…it was delicious and easy to make too! !